October 5, 2012 7:30 p.m. Triple Canopy is pleased to present an evening of performance and reading with poets Caroline Bergvall and Macgregor Card. 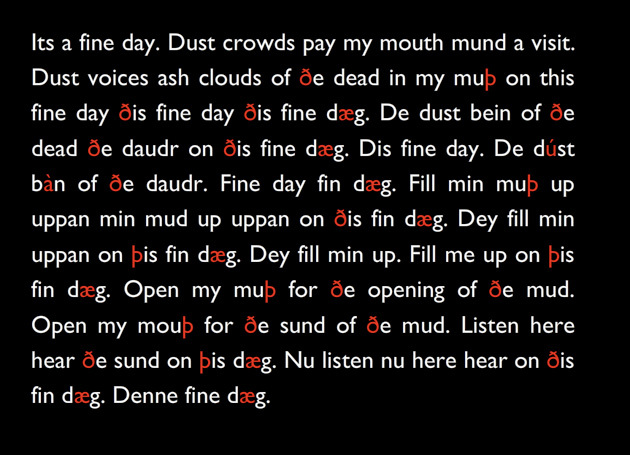 Bergvall’s tongue trips over a lost letter of the English alphabet in her performance, “Ping.” In Bergvall’s mouth, the “thorn”—a runic sign, Þ, representing a distinct “th“ sound and now fallen into disuse—becomes an anachronistic interruption (a Þing), a bodily impediment (an oversized “tooth”), and an accidental implement of writing. Bergvall’s project was inspired by The Seafarer, an anonymous Anglo-Saxon poem from the 10th century. An iteration of this work, along with an animation by Ciarán Maher, will appear in issue 17 of Triple Canopy and forms part of Triple Canopy’s four-part program, Corrected Slogans, a collaboration with the upcoming exhibition “Postscript: Writing after Conceptual Art,” at the Museum of Contemporary Art Denver. Card is a poet of sonic ecstasis who employs revised ballad form, refrain, surrealist lament, gentle stammer. Drawing on the matter of poetry’s past as well as the stuff of contemporary idiom, Card writes across various Englishes (and poetries, English and otherwise). His poems do not so much rhyme as ring: with insistently repeated words, parapraxes, and audible punctuation. He will read from recent work.